Why use WordPress vs a custom CMS? For starters, a background on websites: even very small websites need to be updated and to do this you need a Content Management System (CMS). You can either use an off the shelf product or build one yourself. I've written custom CMSs and I've set up WordPress sites, but now 9 times out of 10, at least, I'd go for WordPress - I just updated my site to it. Partly by it's popularity, it makes it a good option: lots of documentation, lots of support & lots of plugins. Not only that, it's regularly updated and is very easy to use, especially in comparison to the the alternatives. I started by doing a simple mock up in HTML and SCSS, with the key elements of every page: the navigation, header image, main content body and footer. I've built a custom theme based off the Underscores based theme, which shows how lots of things work and made it easy to style. 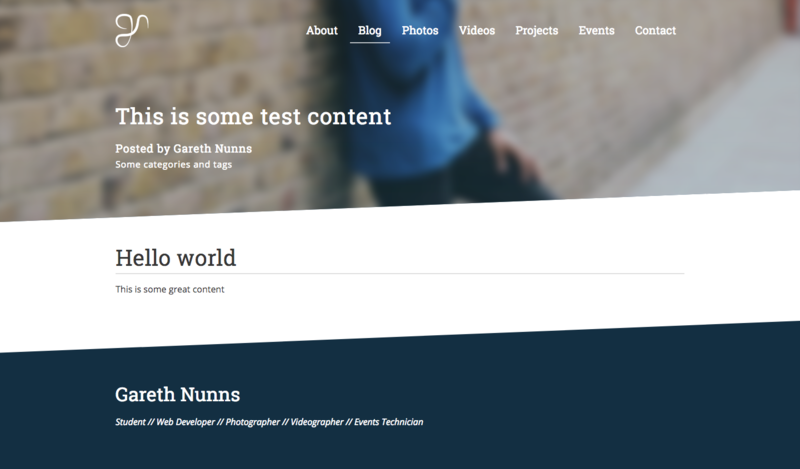 With this theme, it has custom header images and widget areas - like the ones in the blog section and the footer is a widget area. I use the Page Builder plugin by Site Origin to make the layout more interesting, like on the events page. WordPress has lots of great builtin ways to update content and to organise it, such as how simple it is to write this blog post. Part of the issue I had with the previous site was keeping track of the hundreds of images on the site and how they were used - with WordPress you can see where the images are used, furthermore managing the captions and alt tags (alt tags are what is read to blind users, as well as what is read by search engines). WordPress will build smaller versions of the images so that pages load faster. It's easier to move the data to a different CMS as it's a fairly standard format, as well as it being easier to change the theme, which I might do in another three years. In general it makes a lot of things easier with their very large plugin library to chose from. That being said, there is a learning curve to write custom section or plugins, but their documentation is pretty good. SEO (Search Engine Optimisation) is all about affecting how a website is shown in search results, like in Google. WordPress is well recognised by Google and does lots of things commonsensically. It was simple to add Structured Data to all the blog posts which helps search engines to identify the parts of the post, like the author and main text body. Yoast is the most common plugin that comes up when WordPress and SEO are mentioned, which adds some useful metadata to the page and makes it easier to customise how the site appears on social media and in search engines.